I ended my three months of traveling throughout Indonesia and Sri Lanka at the Sanctuary Resort in Thailand. There were things I absolutely loved about it and some things that weren’t so great. I wasn’t expecting it to be, but for those who don’t know this, it’s definitely not a resort. I tend to shy away from “resorts”, so this was fine by me. However, I did find the Sanctuary to be outrageously overpriced, especially by Thailand standards. I paid around $45/night, and that was for a room with no air conditioning and a very uncomfortable hard bed. To use the restroom, I had to enter a door next to where my room was and it was usually full of scorpions, bugs, and spiders. They do have rooms with air conditioning there, but they were all booked and very expensive. Usually, I can survive without air conditioning, but this was one of the most hot and humid places that I’ve ever been. 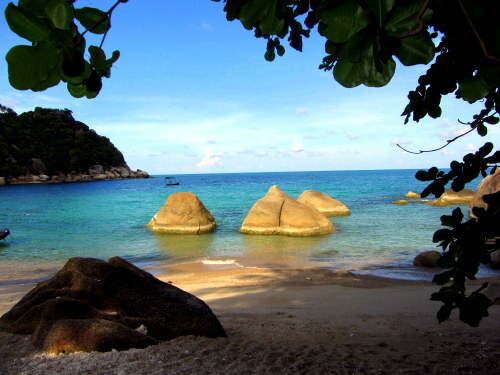 However, the view of Haad Tien bay from the beach of the Sanctuary is absolutely stunning and peaceful. I will say it is also not the easiest place to get to. You must take a boat from Koh Samui. And there are no budget airlines that fly to Koh Samui, so if you fly there, it will be very expensive. The nice thing about the Sanctuary Resort’s remote location is that it’s not crowded ,and it offers a perfect place to relax and just be. I loved the classes that were offered at the Sanctuary Resort. 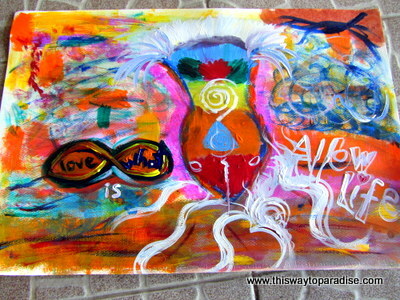 My favorite class was an intuitive painting class. I also took a meditative dance class and yoga classes. There were also a lot of interesting people to meet and hang out with at the Sanctuary Resort, although the teachers or people who had stayed there awhile tended to hang out in their own groups, so it was sometimes hard to meet people. 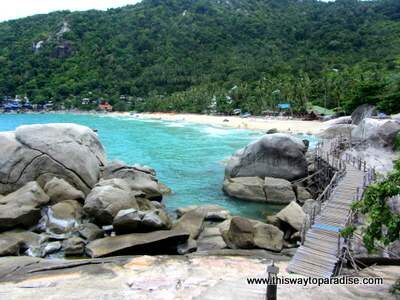 I loved walking around this area of the island of Koh Pha Ngan. 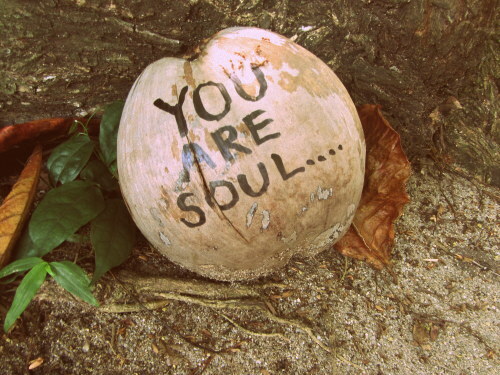 There were coconuts placed along the walking path with creative messages and affirmations written on them. I discovered a place along the beach that gave the best Thai massages I’ve ever had and were cheaper than the ones that the Sanctuary offered. The bays on each side of the Sanctuary were much more isolated and even more beautiful than the one that the Sanctuary is located on. I did really enjoy the food at the Sanctuary Resort as well. I loved the smoothies and fresh juices they offered, and the seafood and fresh vegetable dishes. It was more expensive than the food you will find in the rest of Thailand, but they do have to bring all the food by boat, and I will say the quality of the food was some of the best I’ve had in Thailand. I absolutely loved the coconuts with green powder added to the coconut water at the detox center next to the restaurant. All in all, I did enjoy the Sanctuary, and it was the perfect place to unwind and meditate on the three months of travel that I had just done. However, it’s also probably not a place that I would go back to. I would rather find a place a little more comfortable for the money that I spent there. You also might like my Escape Guide to Thailand! Kho Pha Ngan looks gorgeous! I love the idea of spending a few quiet days focusing on fabulous food, art and meditation – though I have to admit that I would have found the scorpions challenging! Thanks for the honest post! 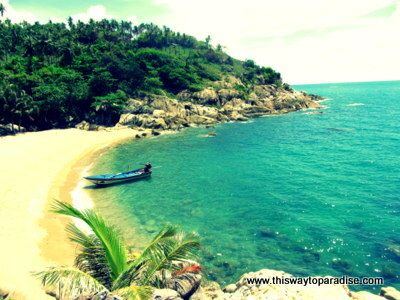 We spent most of our time in Thailand in the cities and countryside, so visiting some of the islands is high on our list for next time we are there outside rainy season! It looks like a sanctuary for sure. Even if you didn’t love it, getting away to these types of places are great for unwinding and also experiencing. And besides, sometimes it’s good you don’t love the place, makes you find new ones. It seems that no matter where you head in Thailand you’re almost guaranteed to find fantastic scenes and beautiful blue water. The images are indeed beautiful and it sounds like you enjoyed yourself with many of the activities. The cost, lack of air conditioning and the scorpions would definitely have an influence on me too deciding not to return. I’m glad you were able to experience the Sanctuary though to unwind and meditate. i love the second picture the most. Ack! Scorpions! The place looks lovely, although yes, a little pricy! !